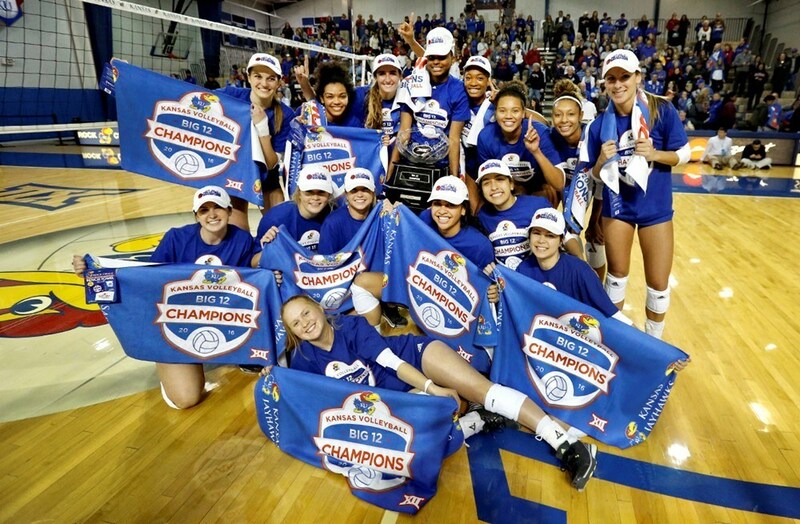 Excitement is in the air and Kansas volleyball head coach Ray Bechard can feel it. As KU football conducted preseason practice on Friday morning, Bechard stepped on the field to observe the team’s progress first-hand before volleyball preseason camp begins next week. When Coach David Beaty noticed his friend and head-coaching comrade near the sidelines, he invited him to speak with the team after practice. Coach Bechard, entering his 20th season at KU, shared to the players that he has noticed a positive change within the football program and that emphasizing the small details can empower big change – a lesson he has lived after guiding KU volleyball from the bottom half of the Big 12 to the Final Four in 2015 and to winning the league title in 2016. “I see a bunch of guys in the hall and I’ve been out to a couple of practices — this just feels a little different than the practices I was watching last year. I can feel a different buzz. I can feel a different momentum. I see guys in the hall — you have your shoulders up, you have your chin up. I talk to people around town — everybody is jazzed for you guys. Everybody is excited. It feels a little bit different and it looks a little bit different. I can feel that too. “One of my coaches once told me, ‘Bechard, if we can get you to contribute a little more than you consume each and every day — think about that.’ If we all just contribute a little more than we consume, think of where we’ll be tomorrow, the next day and the next day. As I tell my team, if we can stack good practices on top of each other, good moments on top of each other, good days on top of each other — great things will happen. Press Release courtesy of Kansas Athletics.